Steer Easy Trike Triple Trees - Modified triple trees with 4 1/2° of additional rake to reduce steering effort on triked Cavalcades. 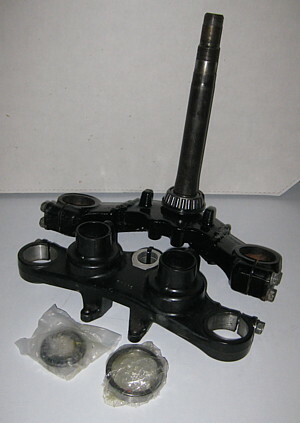 Includes a machined top triple and cut and welded lower triple and new All Balls steering head bearings (lower bearing comes installed on the lower triple tree). NOTE: This conversion is ONLY for a 3 wheel trike conversion or sidecar rig. This MUST NOT be installed on a 2 wheel bike or a bike with an outrigger kit like a Voyager or Tow Pac. For TRIKED bikes or permanent SIDECAR rigs only! Requires the return of your old triple trees after receipt. Price does not include shipping. 50 states shipping for this item is $16.85. When ordered with other items, shipping cost will be based on the weight of the entire order.